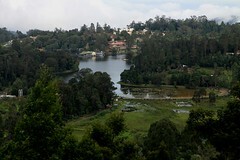 Tamil Nadu, heartland of southern India, is the birthplace of Dravidian civilization. It is the place for long meandering coastlines, thick forests, lush mountains, elaborate temple architectures, rock sculptures, multi colored gopurams, and classical music & dance. 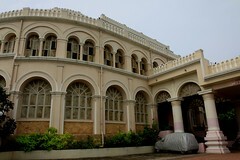 Chennai, the first British settlement in India, was established in 1639 by the East India Company. Modern day Chennai is now an amalgamation of monuments of British Raj period, brightly colored Portuguese churches, Hindu temples and modern buildings. It is a good starting point to start your journey into the cradle of Dravidian civilization. Things to see and do : Vivekandana Illam (Ice House), Kapaleeshwar Temple, Sri Ramakrishna Math, Marina Beach, San Thome Cathedral, Government Museum, Theosophical Society, and day trip to Dakshinachitra. When to go : November to February. If you are going further south to Mammallapuram, then you can stop at Dakshinachitra on the way. Chennai has a selection of excellent vegetarian restaurants. Try Cholayil Sanjeevanam, Murugan Idly Kadai (Shop) and Vegnation. 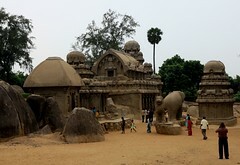 Mammallapuram, once a busy port city of the Pallava Dyanasty, is famous for its giant monolithic temples. 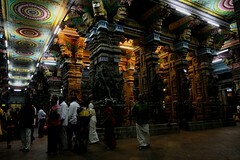 This UNESCO World Heritage Site is a good starting point for those setting off on the popular Tamil Nadu Temple Route. Things to see and do : Arjuna’s Penance, Five Rathas, Shore Temple, Krishna’s Butterball, and Krishna’s Mandapam. When to go : November to March. Spend at least one night here so that you can visit Shore Temple and the Panch Rathas early in the morning before the day trippers arrive from Chennai. All the other sites are pretty much in the same complex. You can cover them on the day you arrive at Mammallapuram. The city of Gangaikonda Cholapuram was founded by Rajendra Chola to commemorate his victory over the Ganga empire. It is now known for the magnificent Gangaikondacholisvaram temple which is part of the UNESCO World Heritage Site of the Great Living Chola Temples. When to go : December to March. Since it is not an in use temple, one can complete the tour in about 2-3 hours. Apart from the temple, there is nothing much to see here. Hence drive on to your next destination after visiting the temple. Kumbakonam, a temple town nestled in the Cauvery Delta, is home to many intricately carved Chola temples. It is here that Lord Shiva shot an arrow to break the celestial pot (Kumbam) so that life could begin again after the Great Deluge. Things to see and do : Kumbeswarar Temple, Mahamaham Tank, Sarangapani Temple, Airavateeswara Temple at nearby Darasuram (14 Kms), Gangaikondacholapuram Temple Temple at Gangaikonda Cholapuram (36 Kms). 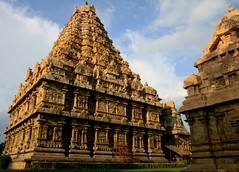 Gangaikonda Cholapuram can be done as a detour visit on the way between Kumbakonam and Chidambaram. Hence plan your itinerary accordingly. Kumbakonam has a lot more accommodation options. Hence use it as a base to explore the neighboring regions. It also a good place to pick up brass souvenirs and/or antiques. Thanjavur, the capital of the Cholas, is one of the most fertile cities in the region due to its location on the Cauvery Delta. The gorgeous Brihadeeswar Temple (UNESCO World Heritage Site) makes Thanjavur a worthy detour stop on your way to either Thiruchirapalli or Chettinad. When to go : December to February. 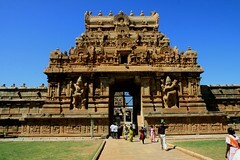 Thanjavur is best covered as a detour on your itinerary. Thanjavur paintings are a popular souvenir. Tiruchirapalli, fondly called Trichy, is home to two remarkable temples – Malaikittai Fort Temple and Ranganathaswamy Temple. The name Tiruchirappalli literally translates to “City of the Three-Headed Demon”. Things to see and do : Malaikittai Fort Temple, Ranganathaswamy Temple and Grand Anaicut. Go to Malaikottai Temple in the evening so that you can view the city from up there after sundown. 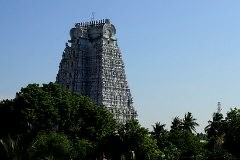 The view tower at Ranganathaswamy Temple offers fabulous views. Chettinad is a cluster of villages around Karaikudi known for its fabulous cuisine and gorgeous mansions built by the merchants. Things to see and do : Chettinad mansions and gorge on the great food. 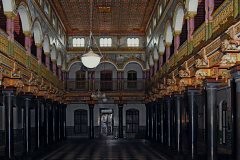 Chettinad is a great place to hunt for souvenirs. Sample the local cuisine which is a unique twist on the traditional south indian fare. Madurai, one of the oldest cities in South India, is a great place to take a peek into the vibrant culture of Tamil Nadu. Birth place of legendary writer and poets, Madurai is home to the famous Meenakshi Amman Temple. When to go : October to March. Evening aarti at Meenakshi Amman Temple is quite an experience. There are privately run buses which offer day trips to Rameswaram. Kanyakumari, the southernmost tip of India, is the place where one can see the confluence of the three seas – The Bay of Bengal, The Arabian Sea and the Indian Ocean. It is also one of the best places to catch spectacular sunrises and sunsets. Things to see and do : Vivekananda Rock, Thirivalluvar Memorial, Devi Kumari Temple, Guhanadeeswara Temple, Sunrises & Sunsets. Puja holidays (October to November) can get very busy. The sunrises and sunsets are quite magical.